Aidan Blum, Past National You Be The Chemist Challenge Participant, Starts Chemistry Career at PVS Chemicals, Inc. If you met Aidan Blum when he was a sixth-grader, you would recall a sweet, shy boy who preferred to stay out of the spotlight. Today, Aidan is an outgoing, energetic project engineer in the corporate engineering division at PVS Chemicals, Inc. (PVS). The transformation Aidan underwent was catalyzed by a role model to which so many trace the beginning of their journey, his favorite teacher. It all started on a cold winter day in sixth grade when Mrs. Frankowiak, Aidan’s favorite teacher, stopped him to suggest he take part in their school’s You Be The Chemist® Challenge. Aidan was hesitant, but his love of science drew him in and he decided to participate. With no chemistry background, Aidan began studying religiously. Looking back, Aidan quotes some of his favorite moments during the Challenge as the time spent studying with his father “who put in many hours making study materials” and quizzing him. When competition day arrived, Aidan’s long hours of preparation paid off. He won the local Challenge, continued to the state level, and made it all the way to the national event in his first year of participating. In the two succeeding years, he continued to shine and was a semi-finalist at the state level. Aidan asserts his newfound confidence in chemistry and experiences with the Challenge greatly “impacted [his] future educational and career goals.” He pursued an International Baccalaureate high school program at the International Academy of Macomb and received his diploma with honors. From there, the Arizona Excellence Scholarship took him to the University of Arizona. There, he had the opportunity to co-lead hosting the American Institute of Chemical Engineers Rocky Mountain Regional Conference and interned with PVS during the summer. In spring 2016, he graduated with a Bachelor of Science in chemical engineering and began his career at PVS, the corporate sponsor of the local challenge in which Aidan originally participated. Looking to the future, Aidan plans to attend both the local and state level Challenge competitions to witness the “brightest students and future leaders of the chemical and STEM fields.” Perhaps a future colleague will be on stage! 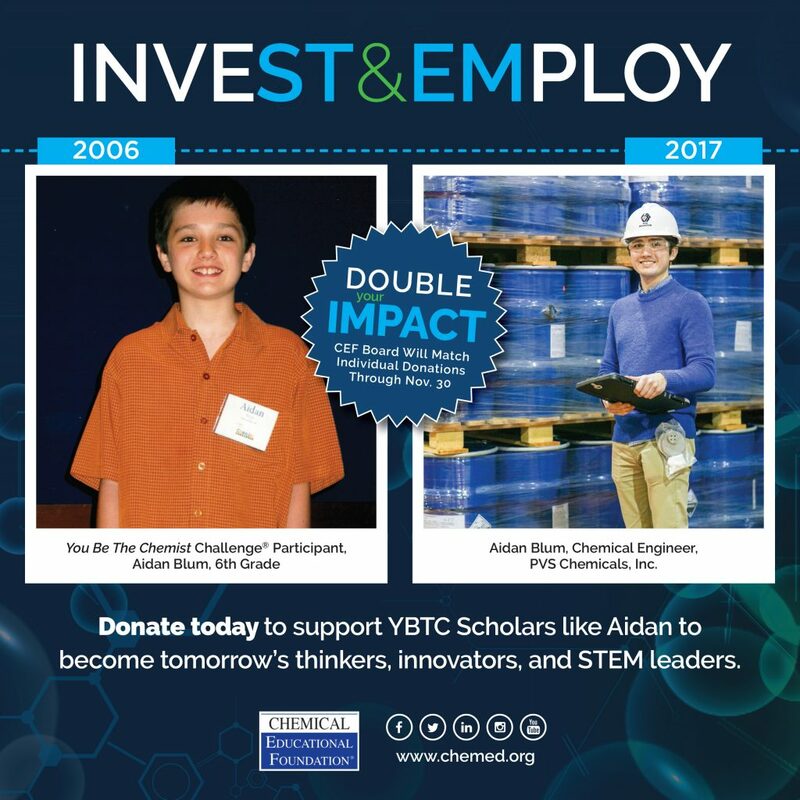 The full-circle nature of Aidan’s Challenge experience, from competing at a PVS-sponsored competition to interning and beginning his career with the company, is the synergy the Chemical Educational Foundation strives to provide young scientists and the chemical industry. By supporting science in their own backyard, PVS inspired a student to pursue chemistry and is reaping the benefits of welcoming a passionate new employee. Individual support is key as CEF works to inspire more YBTC scholars like Aidan.